Look back over the writing you’ve encountered and produced this semester, and then draft a cover letter for your portfolio that explains how you have met the learning outcomes for this course. This letter is an opportunity to think about your writing and clarify — for yourself and portfolio readers — how your skills and awareness of your writing processes have grown this semester. Think of each piece of writing included in your portfolio as an “exhibit” that you are analyzing and reflecting on in this letter. What should your letter do? Explicitly address the course outcomes and how you encountered them throughout the reading and writing for the course. Guide your readers through the exhibits, discussing your writing while looking for larger patterns. What do you see about yourself as a writer when you step back and look at the work you’ve produced this semester? Discuss at least one piece of writing in depth, considering the stages of the writing process as it developed. How did you think about audience, purpose, or genre while you wrote this piece? Explain how you have applied (or will apply in the future) insights from this course in your other classes or other rhetorical situations. Use specific examples, if possible. Employ evidence to support your claims. Just like in the other writing assignments you’ve completed this semester, you will need evidence to support of your argument; however, in this case, the evidence you will use is your own writing. Remember that you need to incorporate quotes into your own writing with clear framing language. Also remember that you always need your own interpretation and analysis of any quote you use in order for it work as evidence. Forms of evidence from your writing exhibits could include, but are not limited to: quotes from your own finished writing (embedded in sentences or longer quotes in blocks); quotes from early drafts of your writing or notes; reported or quoted feedback from others; illustrations or quotations that show how a particular exhibit evolved; or screenshots or images from your work. The reflection essay should become the new home (or index) page for your course site and should begin with a note indicating that the site is an archive of the work that you completed as part of ENG101 at Emory University during spring semester 2018. You should link to the course site, so that a reader who is going through your work can easily find out more information about the course you were in. You should organize the work on your course site into a finished portfolio showing all the work you have done this semester. Make certain that your entire course subdomain looks complete, coherent, and like you’ve given some thought to its overall design and aesthetics. Just like with any assignment you’ve completed this semester, your reflection letter should include at least one image (though you can certainly include more than one. You might consider using your Assemblies image as the primary or feature image for your letter — hopefully constructing that chart will help you to think about how the work you have completed this semester fits together, and hopefully it will help to communicate that understanding to your readers. Your letter will address at least two audiences: your instructor and a committee of raters for the Writing Program. The Writing Program raters will read only the cover letter, not the individual exhibits themselves, so their knowledge will be limited only to the information that you present in that letter. Outcome 1: Rhetorical Composition. Students compose texts in multiple genres, using multiple modes with attention to rhetorical situations. Description: Through composing a variety of texts and using a number of composing technologies, students demonstrate understanding of audience, purpose, and constraints. They use and adapt generic conventions, including organization, development, and style. Outcome 2: Critical Thinking and Reading Resulting in Writing. As they undertake scholarly inquiry and produce their own arguments, students summarize, analyze, synthesize, and evaluate the ideas of others. Description: Students may encounter the ideas of others in a variety of texts generated both inside and outside the classroom: print, visual, aural, oral, spatial. Students learn accepted and ethical ways to integrate other texts into their work, rightly handling citation and adaptation. Students use writing as a critical thinking tool. Outcome 3: Writing as Process. Students understand and practice writing as a process, recursively implementing strategies of research, drafting, revision, editing, and reflection. Description: In learning about their own writing process and doing guided reflective writing about that process, students learn to critique their own and others’ works. They also become aware that it usually takes multiple drafts to create and complete a successful text. Begin by doing some freewriting in response to the following questions. Don’t worry too much about how the pieces will fit together or what it will all look like in a final essay. Just let your mind go to wherever it goes as you think about the question. You should try to write for at least five minutes in response to each question. Use as much detail as you can — try to imagine as clearly as you can but don’t worry about spelling, grammar, or structure yet. Please write about the key moment when, where, and how you first learned to read. What was learning to read like for you? What sorts of books did you read? How did you feel about reading and writing as an adolescent — say, during middle and high school? What sorts of experiences did you have as a reader and writing in school? What are your experiences with social networking sites like MySpace, Facebook, Twitter, or others? What do you remember about your first experiences with such sites? Do you text on a smartphone? What sorts of experiences have you had writing to/for people with those sorts of technologies? What are some of the biggest struggles you have had as a reader and/or writer? What are some of your best moments as a writer? Now that you’ve done some brainstorming, write an essay in which you analyze the key experiences that shaped the way you read and write. Take a step back and reread the freewriting you did, looking for any interesting patterns that you surfaced about your history with reading and writing. You do not need to directly address the questions above or include points from the brainstorming you’ve done, but hopefully in the process of freewriting and thinking about those questions, you’ve recognized some issues or patterns that are interesting enough for you to analyze more carefully. You’ll have opportunities for revision and later in the term I will ask you to remix the writing you’re doing here into a graphic narrative but for now just focus on drafting this essay. Publish your narrative as a page (not a post) on your class website (make certain to add it to the menu, so we can all find it). As with everything you publish for me this semester, you need more than just words for your narrative — you must have at least one image, video, or audio file with your narrative. You’ll need to provide a caption and give credit to the creator of the image (even if it’s your own). We’ll talk briefly in class on Tuesday about Creative Commons and finding CC-licensed images with Flickr. Once you have published the page, you need to also write a separate blog post. That post should link to the page you have published and reflect on the process of writing it. Further instructions for the reflection post here. For this project you will draft a “model” or a “map” — not necessarily a geographic map — that highlights spatial, temporal, thematic, or structural elements of Tillie Walden’s Spinning. How do you understand Spinning differently when you see it through the map that you’ve made about it, rather than you did when you were reading the book panel by panel? How does this abstract model of the memoir reveal qualitative or quantitative aspects of the book that would elude a typical close reading? What questions about Spinning led you to focus on the element(s) that you did when you created your map? In the two books we have read most recently, Joe Sacco and Guy DeLisle both rely on vignettes as a primary mode of their storytelling. Vignettes are a mode that Ian Bogost discusses in the second chapter of How to Do Things with Videogames, where he looks at a series of videogames designed to foster empathy, observing along the way that many of these games are vignettes rather than full-blown simulations. “In literature, poetry, and film, a vignette is a brief, indefinite, evocative description or account of a person or situaion,” he explains. “Vignettes are usually meant to give a sense of a character rather than to advance a narrative. [They] are impressionistic and poetic, depicting an experience or environment, roughly, softly, and subtly” (22). After a brief explanation for why vignettes are relatively rare in videogaming, he looks at some analogous vignettes in film, where he says that vignettes “offer detailed, sordid glimpses into the lives of residents” of urban areas. Bogost continues, “The vignette is neither essay nor documentary. It does not make an argument, but characterizes an experience” (23). Write an essay in which you compare Pyongyang and Palestine, paying special attention to the way in which they structure their narratives around vignettes. You should think about the passage from Ian Bogost quoted above as a kind of lens text which you can use to help in this analysis (and perhaps to think about these two graphic novels as examples to read back against the analytical lens). As with all the major projects this semester, publish your essay as a page on your site. Then write a post that links back to your essay. In that post, you should identify the controlling idea of your essay and also reflect on your own writing process for this project. How many stages of draft did you go through? What methods did you employ to arrive at your controlling idea? What choices did you make in organizing your essay? Bogost, Ian. How to Do Things with Videogames. Minneapolis: U of Minnesota P, 2011. Audience: You should assume an audience that has read Maus and thought about it a little bit, but who understands the books not quite as well as you do. The style of your written reflection should be “academic casual.” I expect clear, coherent, grammatically correct prose. You are not required to use any outside sources for this assignment; however you are allowed to use any of the analytical texts from the class or any outside analyses of Maus as you write your reflections. Make certain that you cite any sources (and link to any texts that are online). This assignment is an exercise in close reading and explication (see Understanding Rhetoric page 81 and following for more on explication), in which you will look very carefully and precisely at 2 pages of your choice from Maus, making notes about what you observe, and then you’ll present what you uncover in the process and draw some connections between what you see in those pages and the larger narrative. You will trace two different pages for this project on tracing paper that I’ll distribute in class. A “page” means a single verso or recto page. You may do a two-page spread, but only if that spread forms a coherent unit, in which case a two-page spread will count as one “page” (and that will make this assignment more difficult for you, so consider carefully before you take it on). Your two pages should feel distinctly different from each other. My preference is that you choose one page from Book 1 and another page from Book 2; however you may make a case to me to choose two pages from the same book if you have a specific reason to do so. Come talk to me and present your reason for doing so. The only criterion other than the two caveats above is that you should find the pages compelling. Remember earlier in the semester when I asked you to choose a single panel that was the “most important” from our reading that day and said that part of what you would need to do is to explain, while writing about it at the start of class, what you mean by “important”? This process should be similar — a page might be compelling to you because of one particular moment on it that really stands out or because of something odd or confusing or quirky that you want to spend more time thinking about. You might find yourself thinking about a larger theme of the text that you know you ultimately want to address and then looking for for pages that will allow you to do so. Or you might find yourself thinking about interesting pages that somehow surprised or captivated you and choosing those pages without knowing ultimately exactly what themes they will lead you to address. Either approach is potentially fruitful. Pick a compelling page from Maus and trace it. Your goal is not to create a look-alike reproduction of the original page but rather to distill the original page into a simplified line drawing. If there are caption bubbles or boxes, you should trace their outline, but please do not copy the text within. Once you have finished tracing, scan it digitally and save the file as an image (jpg or png). Use an actual scanner (the best scanners for this purpose are located in the Media Lab space on the 4th floor of the library) not a simple cell phone photo. Either print out the scanned image or make a photocopy of your trace page, so that you can draft the next step without worrying about destroying your first trace image. Annotate the printout or photocopy of the traced page with “gutter text”—your own text, written into the gutters, margins, and empty captions of the pages (see instructions for annotating below). When you are satisfied with the annotation on the traced page, scan that page and save the digital image at a high resolution (again, use an actual scanner). For the second tracing select a page that feels distinctly different from the page you traced earlier — maybe there’s something different about the overall layout, or the artistic style, or the tone of the page. In any case, select a page that provides visual tension with your first tracing. As in the first tracing, distill the original page into a simplified line drawing. After you have traced this page, repeat the rest of the steps above, this time annotating with an eye toward what makes this page different from your first selection. Think of your gutter text as a dissection of the page, in which you highlight both the salient and the subtle characteristics of the page’s panels. 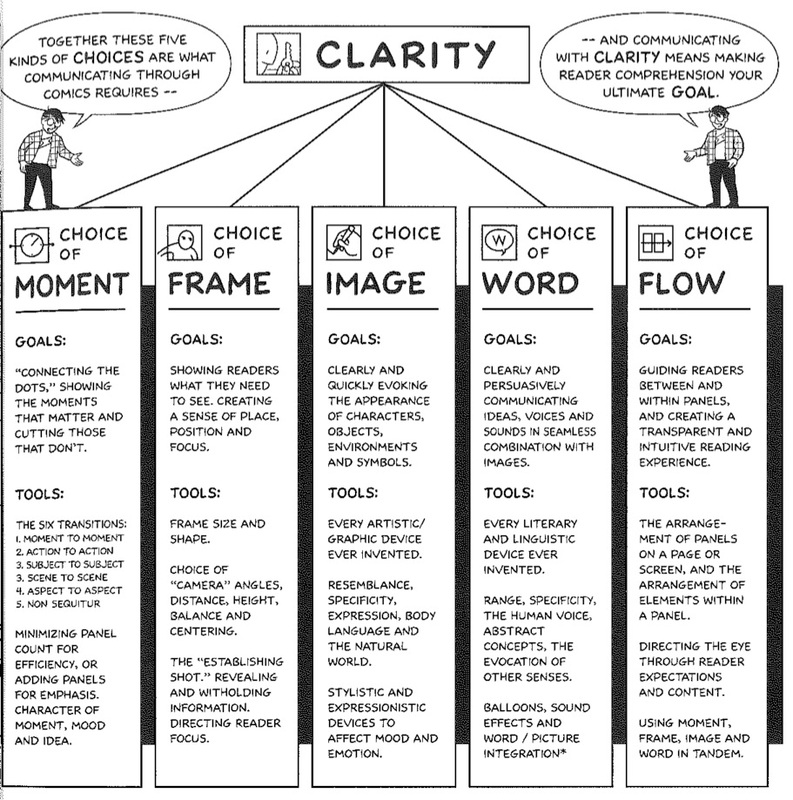 Detail from Making Comics by Scott McCloud showing the kinds of choices writers make when communicating through comics. 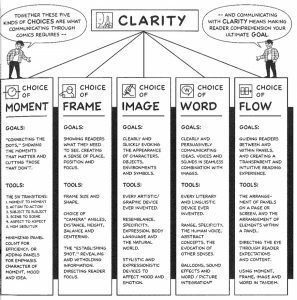 As you annotate the page, focus on recognizing the choices Spiegelmann makes with regard to Scott McCloud’s framework of writing with clarity: choices of moment, frame, image, and flow (don’t worry about word just yet). In this process, you might find yourself noticing the various formal features of the drawing: color, saturation, shading, line styles, shapes and sizes, angles and placement, perspective and framing, layering and blocking. Or considering the relationship between the elements on the page: the transitions between panels, the interplay between words and images, the way time and motion are conveyed. Remember, as Nerdwriter argues in the video embedded above, that the unit of communication for comics is the page, moreso than the panel. Pay attention to the overall layout of the page: the use of gutters and margins, the arrangement of panels, the flow of narrative or imagery. How do all the various panels on the page work together to create a clear and coherent unit? What do you notice when you look at the page as a unit? You might not be able to fit all your notes actually on the page, in which case you can either write them on additional pages or type them up and add them onto the page when you upload your traced images. If you need additional space to include your notations like this, you should probably number them and add reference numbers on your traced image so your notes can point to specific spots on the page. Once you have completed your annotations, publish 2 pages on your site, one for each annotated tracing page. Include a large version of your scanned traced page (or a smaller size image that links to the full sized image) and any additional notes. Now that you’ve spent some sustained time and effort looking very closely at these two pages, take a step back and go through your notes, think about what you have seen, and identify any patterns that come to your attention. There are many ways to approach this analysis, but one promising point of departure is to explain what drew you to the two pages you traced. Explain decisions you made while tracing: What did you find yourself leaving out of the tracing? What did you find yourself striving to include in the tracing? Why? What did the act of tracing reveal about the page? What did the product of your tracing reveal? Is there a difference between the two? Think about how these two pages you’ve focused on fit into the work as a whole. How closely does your tracing capture the dominant narrative or visual themes of the overall work? 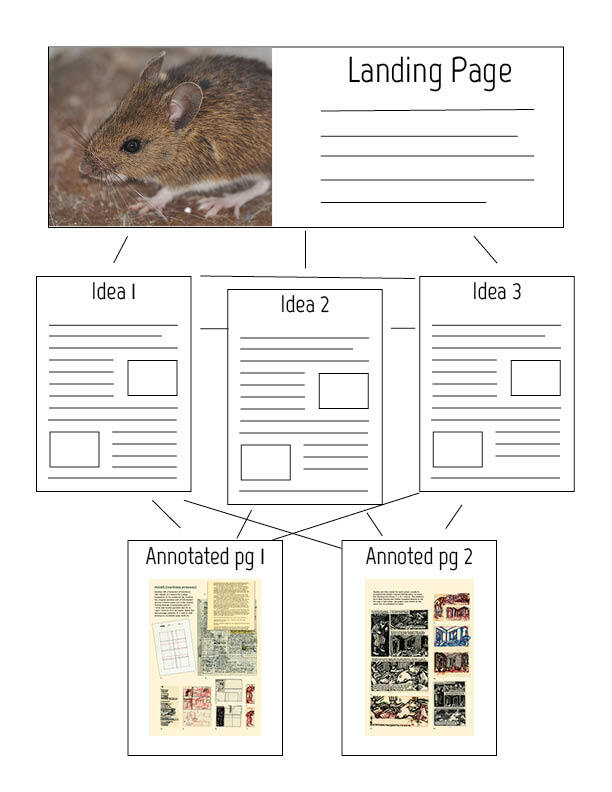 After thinking carefully about the tracings and your annotations, decide on three ideas, patterns, or points of connection that are the most interesting. Each of those ideas should become its own page (each about 250 words) as part of this project. Each of these pages should make an arguable claim about something you have observes in your two traces pages. Each of these pages should address both of the two tracings that you made (so definitely do not write 250 words about the first traced page, then another 250 words about the second traced page, then 250 words about something else). Draw contrasts and/or comparisons across your two traced pages in each part of your project. Each of your pages should include, along with the 250 words of text, one or more images. Each of your traced pages will have their own place in the project (see Publishing below), so do not include a scan of your entire page as an image here. You might crop your traced page to include specific details that you’re describing in the text. You might scan particular panels of Maus itself and put those panels into conversation with your traced pages — this might take the form of showing the panel(s) both as you have traced them and on the page, or it might take the form of showing panel(s) from a page that you did not trace that connects to your argument in some way, or you might find some other use for such scans. You might also find or create other images that somehow help you to make your own argument. Maybe it helps you to show an actual map of Poland against the backdrop of Spiegelman’s drawn map. Or maybe a few frames from another comic, like Rosalie Lightning or Nancy, would somehow help you to further your argument. Or maybe the Mona Lisa would be useful for you for some reason? Look for places to make connections between the three pages. Create hyperlinks between the pages at those connecting points. After you have created these three pages, create the landing page. It should have a compelling visual image of some sort, and one paragraph of text pulls together the three patterns you identified, even if it’s something of a loose connection between them. The idea here is to provide at least a gesture towards synthesizing the patterns and that serves as something of an overview of/introduction to your project as a whole. A landing page, with a compelling visual of some sort and one paragraph that lays out your project and links to the three pages of your analysis. One page for each of the three significant ideas you are explaining in this project. One page for each the scanned images of your two annotated traced pages, plus any additional notes. Once all the pages are published, a blog post that links to your landing page and reflects on your own writing process.